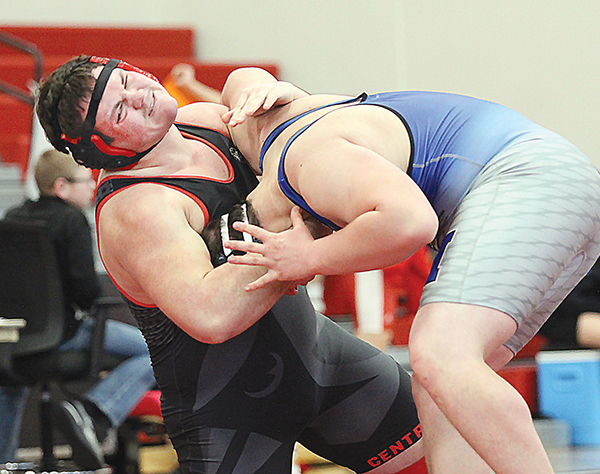 Led by 220-pound champion Jon Merten, Boone Central/Newman Grove finished smack dab in the middle of the team standings in Saturday’s Boone Central Invitational in Albion. That result might seem modest at first glance, but in a strong field of teams, on a day when the Cardinals saluted seniors Michael Brengelman, Tyson Haddix, Ethan Dozler, Merten and Dalton Rassmussen, BCNG Coach Josh Majerus said there were many positives for his squad. “A lot of good things occurred today,” Majerus stated. “First, we recognized a great senior class of wrestlers in Michael, Tyson, Ethan, Jon and Dalton. The 8th place finish was in a very tough tournament. “Jon wins his weight class. Gavin (Dozler) outworks the #5 kid in the state and dominates the match. Dalton revenges a loss to the #6 wrestler in the state. “Overall, a tough day, but we wrestled well. In addition to Merten’s title, Rasmussen took runner-up honors at 285 pounds, Haddix (132) placed 4th, Gavin Dozler (106) and Will Grape (120) finished 5th and Ethan Dozler (160) took 6th. In the junior varsity division of the tournament, Boone Central/Newman Grove’s Michael Brengelman (126) placed 2nd, Cole Greek (285) finished 3rd and Landin Pribnow (160) took 4th. A large crowd also saluted retired Cardinal Coach Dale Bonge, who was honored for his 35 years of service at Albion and Boone Central with an achievement placque.